Intechtel offers residential Internet service with available download speeds up to 940Mbps (not available in all areas.) All plans come with a dedicated local account manager to handle all of your needs, and if you ever need technical support or just basic computer help, we are here for you! Lets see any other Internet company do that! Call us at 208-635-4400 for information on other available plans and services. Not sure about what Internet service plan would best fit your needs? Check out our page on choosing Internet service or give us a call, we would be happy to assist you with any questions. See some of our most popular home Internet service, TV, and phone packages above. Intechtel now offers wireless Internet Service in western Kootenai county and Eastern Spokane county! Call 208-635-4400 for details. Fiber optic Internet allows for the best and most efficient service because there is a direct physical connection to your location. There is no noise or interference. Fiber has lower latency than other Internet service types. The next option would be a coaxial (cable) connection (see plans above). It can achieve near Gigabit download speeds, but generally won’t be symmetrical (equal upload and download speeds) like with Fiber but is still a great service and less expensive than high-speed fiber optic Internet service. Lastly, there is DSL (see plans above). It runs through copper phone lines and typically has much slower speeds than fiber and cable Internet. DSL using current and past generation technologies such as ADSL2 and VDSL Internet service will most likely become obsolete except in rural locations as consumers demand for high bandwidth outpaces the providers ability to deliver the needed speeds. One advantage to DSL is that the latency can be lower than cable-based services. Let us help find the right service for you. Symmetrical service has the same download and upload speeds. For example, dedicated fiber optic Internet service is symmetrical because download and upload speeds are the same. Asymmetrical service has a different download speed than the upload speed. Asymmetrical service is the most common for residential and small business Internet service and includes DSL and cable Internet. What you need to understand is that during peak usage hours, some Internet services maximum available speeds will typically be slower. This can commonly impact streaming and downloading. Pay attention to the download and upload speeds you are paying for. For instance, the cable Internet service for $44.99 (listed above) has up to 100 Mbps download and 10 Mbps upload speeds. Compare that to the $20 DSL service (listed above) with only 6 Mbps download and 1 Mbps upload speeds. If you do a lot of uploading, downloading, or streaming you may want to sign up for a higher-speed cable Internet service. Gigabit cable service is perfect for multiple users to be connected at the same time and have a consistently high speed available. Keep in mind, there are some platforms out there that have restrictions on their own network to manage and limit speeds coming in and out. For instance, if you tested your connection on a PS4 or Xbox your may not speed test out at the same speeds. This is due to both the distance between you and the servers you are testing your speeds with, and the maximum speeds those servers are capable of serving you at. Gigabit Internet Services provides a large amount of bandwidth directly to your home or business. It allows dozens of devices to be connected with plenty of bandwidth for each device. Typically, no device will experience slow speeds with Gigabit Internet service. Available Internet speeds maybe increasing in your area and we are here to offer a few tips to help you achieve the best results for the price. When it comes to actual data throughput it won’t be an exact Gig. There is always a little overhead due to physical limitations of your router, switch, computer, and the gigabit standard itself. More than likely you will speed test out at up to 940 Mbps, even though the provider provisions your modem for over 1000Mbps. When choosing your router, you need to make sure you read the box carefully. You want to make sure the router can support the speeds you are going to be paying for. In some cases, you will see router ports can support the speed, but the CPU isn’t up for the task. We always recommend using a hardwired connection vs WiFi for critical devices because when using WiFi you will lose some of your speed due to a number of factors including interference, the frequency, (2.4 vs. 5GHz) and the capabilities of your devices themselves. (see Wired vs Wireless). There are some laptops out there that don’t have an Ethernet port at all, so you must buy a USB adapter. You need to make sure that the USB adapter can reach the speeds you are trying to achieve. When using a USB adapter, you may lose some speed. USB 3.0 and 3.1 adapters offer the highest speeds. There is a lot that can interfere with your Wi-Fi connection such as, baby monitors, Bluetooth devices, garage door openers, other Wi-Fi networks in the same place, etc. That’s why it’s important to choose a channel on your router that is clear. Otherwise, collision or interference can happen. Collision happens when there is more than one device on the same channel and it can cause your connection to be spotty or stop all together until the channel is clear again. If you are using a 2.4 GHz band, we recommend only using channels 1,6, and 11 since they are the only non-overlapping channels in the 2.4GHz band. The 2.4 GHz band is some what susceptible to interference due to how widely it is used and how many devices rely on it. If you are using a 5 GHz band, there is less interference but you may run into issues with distance because a 5GHz signal cannot penetrate obstructions, walls, etc as well as lower frequencies such at 2.4GHz. The farther away you are from the router the weaker the signal. Wi-Fi issues can be tricky to diagnose without the proper tools and knowledge. If you have questions about the Internet Service purchased through Intechtel, feel free to call with questions. For optimal speeds, you need to make sure you are working with the latest standards for your router. Wireless AC Wave 2 Multi-User Multi-Input Multi-Output (MU-MIMO), supports 160MHz channels, quad streams and extended 5GHZ channel support for extended Wi-Fi reach. Keep in mind that even with a router that can support these new standards it doesn’t necessarily mean that the devices you are using can. If an older device is connected to the Wi-fi and it can’t handle the new speeds, then it can slow down any other device that is on the same band. When buying a router, pay attention to the marketing and know what they are really saying. For example, when you are looking at a router and notice that it says that it can get up to 2334 Mbps, what it is really saying is that you can get 1734 on the 5 GHz channel and 600 Mbps on the 2.4 GHz channel. Don’t be fooled into thinking that you will get that on both channels. They typically just combine the total “on-paper” maximum speeds. Updating your equipment’s firmware is an essential part to keeping your network up to date. Typically, the most interaction people have with their routers is turning it off and back on when the connection has issues. For optimal performance and security, you’ll want to update as often as you can and get familiar with its features so you can get the most out of your router. 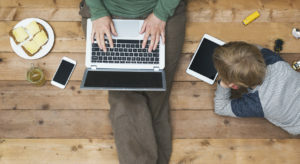 There are many advantages to having a hard-wired connection compared to using Wi-Fi. Yes, using Wi-Fi is convenient and is very easy to use. But, what most people don’t know is that you can lose speed through a Wi-Fi connection, open yourself up to security issues, experience latency issues and have an inconsistent connection. Ethernet connections are a safer and stronger connection than using Wi-fi. You will have faster speed, meaning you can transfer data much faster from your computer to the Internet. When it comes to security it is much easier to secure and limit the chances of a security breach. Also, you will want to have a hard-wired connection if you are running a local area network because it transfers data from computers much faster than over Wi-Fi because of the direct connection. It’s important to keep in mind that your data will not move between devices at the same speed as your Internet connection. Heavy bandwidth usage in say, an office building, is the main cause of slow data transfer between devices. It’s extremely important to understand the role wiring plays in achieving your full speeds. Cat6 ethernet cable has less crosstalk than CAT5e, so it works better in areas of high density cable installs or around EM/RF interference. When connecting to your modem or router, CAT6 can support much faster speeds than CAT5e. CAT5e can only support up to 1,000 Mbps while CAT6 can support up to ten times that. We serve clients in Coeur d’alene, Post Falls, Hayden, Spokane and surrounding areas in the Northwest. Shoot us an email, give us a call, or fill out our message form to contact a representative at Intechtel. We look forward to hearing from you! Coeur d Alene, Post Falls, Hayden, Hayden Lake, Rathdrum, Sandpoint, Athol, Harrison, Kellogg, Newport, Liberty Lake, Spokane Valley, and Spokane.